Round Halo Diamond Engagement Ring | Shane Co. This enchanting halo engagement ring features 42 round diamonds, at approximately 1.30 carats total weight, that have been hand-selected and matched for exceptional sparkle. 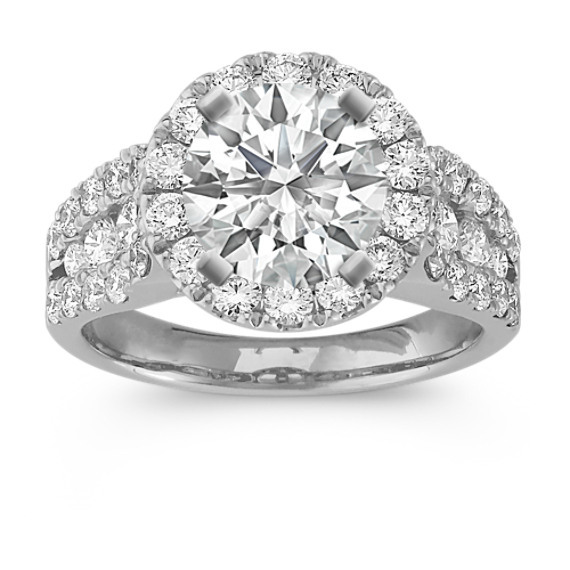 Set in superior quality 14 karat white gold, this ring awaits the center diamond of your choice at approximately 1.50 carat. Gemstone Carat Weight :1 1/4 ct. t.w. Like a celebrity engagement ring! I am madly in love with my engagement ring! It has endless sparkle. It is an eye catching beauty at an amazing price! I have heard women talk about how they do not wear their engagement ring because it cost a lot and they fear they will lose a stone. With Shane Co backing my engagement ring up (for FREE), I wear my ring everywhere with pride!! Thank you Shane Company. This ring has layers of stones along the band and with the halo. It has so much sparkle that everyone I pass takes a second glance. Even men compliment my beautiful diamond ring. HELLO!! !